I think I've mentioned how much I love to snack on food versus having an actual meal. It's probably even more so now as a mom because my day is broken up in smaller increments of time to care for my son. So when I'm craving for pizza but don't want to go through the hassle of making a pizza dough or even popping in a frozen one in the oven, the next best thing (maybe even better) is a Hot Pizza Dip. With this, you get all the goodness of a pizza without all the hassle. You could warm it in the microwave if you wanted to to save time! This dip layers Italian seasoned cream cheese, mozzarella cheese, tomato sauce and all your favorite pizza toppings. To serve, cut up some garlic bread and dip away! To make, it couldn't be any easier... and you can even make it in advance. 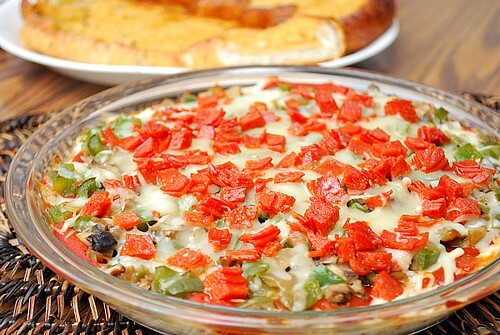 Sautéed onions and peppers are cooked up and Softened cream cheese is seasoned with Italian seasoning and layered on the bottom of a pie plate or serving dish. Mozzarella and Parmesan cheeses are sprinkled on top before spreading tomato sauce. Sautéed onions and peppers are added on top along with more cheese and pepperoni. The whole thing is baked or warmed in a microwave oven. You can serve this with slices of bread (toasted is great) or even better, garlic bread. In a skillet, sauté butter, green pepper, onions and mushrooms until softened; set aside. In a small bowl, mix together the cream cheese, oregano, parsley, and basil. Spread mixture in the bottom of a 9 inch pie plate, or a shallow microwave-safe or oven-safe dish. Sprinkle 1/2 cup of the mozzarella cheese and 1/2 cup of the Parmesan cheese on top of the cream cheese mixture. Spread the pizza sauce over all. Sprinkle with remaining cheese, then top with green pepper, onion and mushroom sauté. Top with pepperoni. Bake in preheated oven for 10-12 minutes until warm and serve hot with garlic bread slices. The "men" in my household are both home with colds. Grumpy and helpless they are, but I have a feeling that this would bring a smile to both of their faces, especially the 14 year old. Perfect!! This looks really, really good. I'm a big snacker too and I often want to snack on a variety of things instead of having a big meal. Especially for lunch! Fantastic idea. 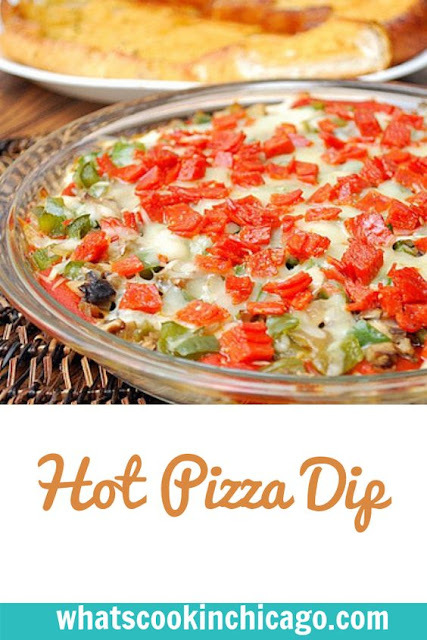 Pizza dip sounds great. Nice eats my friend, very jealous, you upstaged me big time! Ohhh, I am absolutely DROOLING over this!! !